With an increasingly demanding population that has an ever growing concern for its quality of life, a term that used to be rare in the field of life sciences has come to the foreground of the dental treatment scene: aesthetics. A whole new range of biocompatible dental materials, paired with the development of Cad-cam technology that allows for a perfect fit, have revolutionised the field. This has provided not only a new aesthetic challenge, but also a substantial improvement in functionality, adhesion and duration of the treatments. Veneers are an option that let us change the size, shape and colour of a tooth with minimal dental preparation. Furthermore, it lets us obtain a translucent, shiny and natural appearance that ensures perfect harmony and long term functionality. Sometimes, after a root canal therapy, the tooth may be weakened, and the onlay of a crown may be necessary to give the tooth its strength back. This is necessary to guarantee the chewing function in the long term. That is to say that it is not only a matter of aesthetics: functionality is at stake. Until recent years, this issue was solved with the traditional porcelain over metal crowns. Though still a valid solution, we ought to inform our patients that nowadays we have the possibility to equip them with 100% ceramic crowns, without any metal. These are highly resistant and biocompatible, since they integrate perfectly with mouth tissues, avoiding those grey lines around the gum that appear overtime on metal composed crowns. These type of onlays, that we develop with the Procera system, adjust perfectly to the surface of the tooth, covering it and protecting it from external agents. Crowns may also be necessary when a great deal of tooth tissue has been lost, either to an important cavity, through trauma or because of changes in tooth colour. In these cases, crowns without metal allow us to carve the tooth much more conservatively, thereby using appropriate cements that will then bond with the piece. This is the revolution of what is called adhesive dentistry. 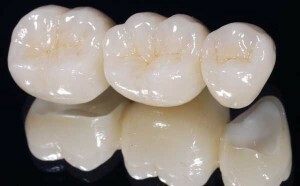 Nowadays, besides 100% ceramic without metal crowns, we also have access to high resistance materials like Zirconium. Zirconium crowns offer another alternative, where its application provides a double benefit: high aesthetics and high resistance. It is one of the choice materials for fixed work, either for natural teeth or for implants, with a high durability overtime and unaltered colour and shine.